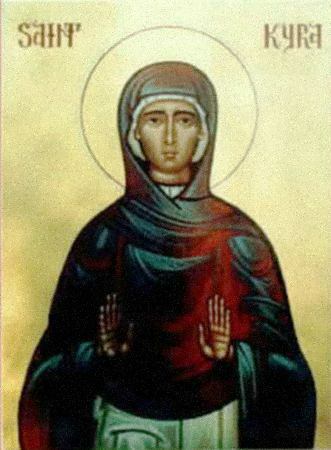 The Nuns Marina and Kyra, sisters by birth, lived during the IV Century in the city of Beria (or Beroea) in Asia Minor. Their parents were illustrious and rich, but the sisters upon reaching mature age left home and departed the city. Having parcelled off a small plot of land, the holy virgins sealed up the entrance to their refuge with stones and clay, leaving merely a narrow opening, through which food was passed through to them, and they lived under the open sky. On their bodies they wore heavy iron chains and patiently they endured hunger: during the course of three years they accepted food one time in 40 days. Their former servants came to them, wanting to join their ascetic life. The saints situated them in a separate cottage hut not far from their enclosure and they guided them, exhorting them to deeds of prayer and fasting. 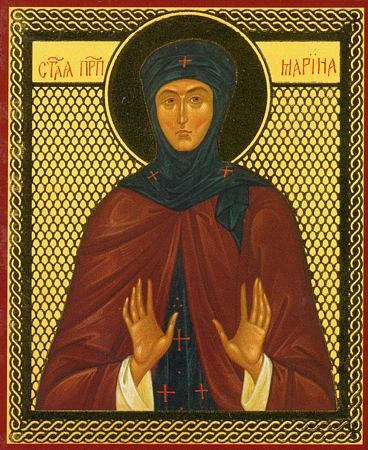 The life of the holy ascetics Marina and Kyra was well known to Blessed Theodorit, Bishop of Cyr: he alone, out of respect for his hierarchical dignity, did the holy virgins allow into their dwelling. Blessed Theodorit conversed with them and persuaded them not to overburden themselves with the bearing of chains, which were so heavy that Kyra being weak in body was always stooped under their weight and unable to straighten up. Thus did they pursue asceticism over the course of 40 years. They disturbed their solitude only to make a pilgrimage to Jerusalem to pray at the Sepulchre of the Lord. During the time of travel they partook of no food until they prayed at the Holy Places, and returning back they likewise partook of nothing. Such an exploit they did yet another time, when they journeyed to the grave of the First-Martyress Equal-to-the-Apostles Thekla at Isauria. The Nuns Marina and Kyra died in about the year 450.